My grandfather’s birthday is today. He is turning 82. I’m so happy that he, along with my grandma and uncle have spent the winter in Wilmington (not that convincing them to leave the cold of Western PA was that difficult.). It has been so wonderful for Lucas to have his great-grandparents and uncle here for the past few months. Lucas and Pap are pretty tight so he wanted to make him a special birthday card – I swear, he told me this himself and even found the pins on Pinterest for me! 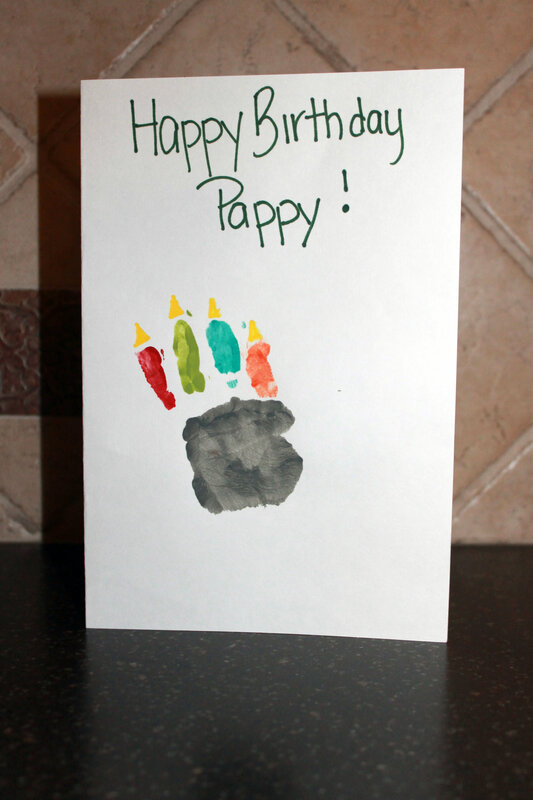 Because the instructions I found didn’t work that great with a 10 month old, I thought I type up a quick lesson on how to make a Birthday Cake Handprint Card with an older infant. A paint brush (or foam would work too). **In hindsight I would have had five clean paintbrushes instead of rinsing and drying the one I grabbed. I put L in his high chair to make it a little easier (on me, not him). I painted L’s palm one color (the cake) and each finger a different color (the candles). In an effort to save you from the mistakes I made, let me break down the easiest way to get this done. 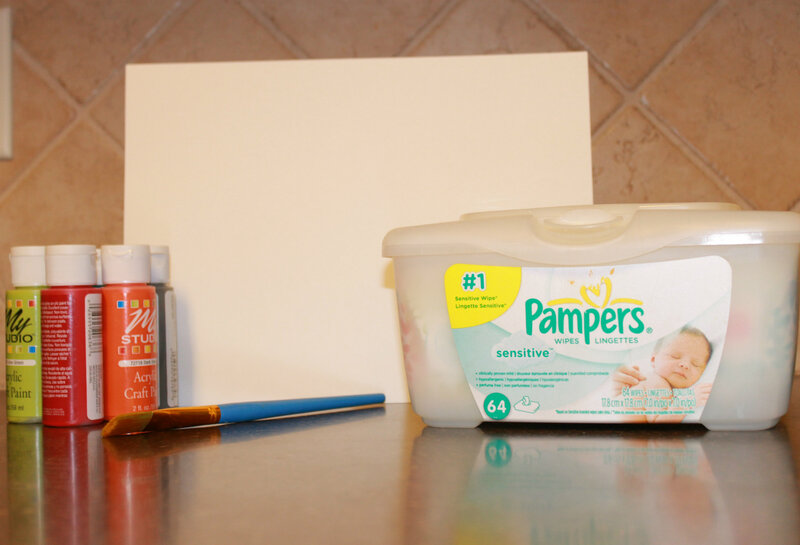 First, have a helper, especially if your little artist is too young to really know what’s going on. I had to enlist D to help me. It probably didn’t make it any easier that I chose L’s grumpiest day in the last three months for our art project, but having an extra set of hands was much needed. Second, do each piece individually. 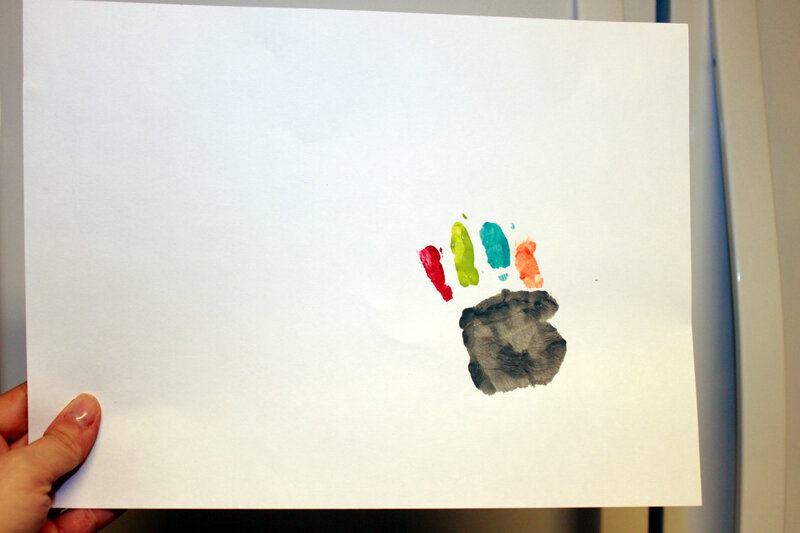 I painted L’s palm first and then (firmly) pressed in onto the paper. I cleaned him up with a wipe and then moved on the first finger. I did each finger individually as well. Third, move the card (quickly if you have a sneaky little fox like I do) after each print is made. 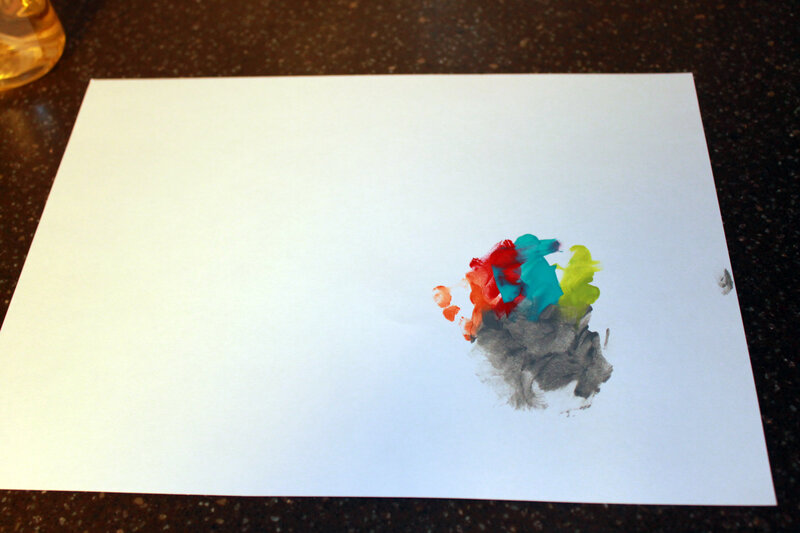 L wanted to grab and touch the paper and I really didn’t want him getting the wet paint all over him. Our second attempt ended up that way. Fourth, baby wipes and a magic eraser are you friend. Okay, that one is probably a little obvious, but we certainly went through our fair share of wipes. And the magic eraser has gotten paint off of our highchair more than once. Here is what the card looked like after I had all of L’s hand on it. After it dried I used a yellow marker to add “flames” to the candles and finish off the card. Lucas gave it to Pappy at his birthday lunch yesterday. He certainly seemed to like it! And because of my “MommyFail” in forgetting to bring my camera to lunch I don’t have a picture of L and my grandpa from his birthday. BUT, I do have this great shot I took at Christmas. In fact, we framed this picture and gave it to Pappy for his birthday.